Can someone please stop me from buying fabric? Please. My husband begs you. I have been completely incapable of finishing anything this past week and a half, even though I have several projects in progress. This weekend I set out to sew early in the day Saturday and Sunday and was thwarted each time. What did I do instead? I organized my fabric. I know I should be ashamed at how much I've accumulated, but it secretly makes me happy when I walk by. I cleaned out my closet and did a major cull. I feel good about that. Oh yeah, and I bought this couch from the Salvation Army. With the grand intention to reupholster it..... ack! Sorry I trailed off there. I'm a little embarrassed that I'm even proposing this. J and I stopped by the Salvation Army after lunch on Saturday. We fell in love with this couch but had no real desire to purchase it. Luckily, J and I have similar taste in furniture and home decor. We both like antiques and artsy, quirky things. While we were looking at it, an employee glanced over and said we could have her for half price. Half price made it a whopping twenty seven dollars. We couldn't not buy it, right? J used to work doing faux finishes in homes and on furniture. He can paint just about anything impeccably. He's excited about repairing the damage to the frame. I should also mention that school's out for summer after this week. Hands down the best thing about being a teacher ;) So, this becomes a major summer project. Destruction of the old upholstery begins this coming weekend. The only reason I'm even writing about this now is because blogging will keep me honest about it, whether I succeed or fail. My weekend in a nutshell. Instead of finishing that simple cotton a-line skirt I've started, I hatched a plan to upholster a couch. All the photos in this post were taken with my brand spankin' new iPhone. I've had it for a week and I'm not sure how I ever lived without it. This one below is just for fun. Instagram. I feel like it's about time I actually made a wearable dress. It's been a while. I seem to make separates most of the time. Surprisingly, the majority of my pattern collection is dresses even though I rarely wear them. I like wearing dresses. I just don't own many that I would wear on an everyday basis. That may be something I need to remedy. Anyhoo, this is the Lisette Passport dress that has been popping up everywhere lately, Simplicity 2209. It's been languishing in my sewing room for two months now waiting on a hem. A hem! (Ahem-- funny) I made it up for a wedding back at the beginning of April but had no time to finish. I decided it was due time this past week. I was pleased with the pattern. Fit well right out of the envelope. So little fabric used. That's nice compared to some patterns that seem to just eat it up. The crossover dart is my favorite detail even though my fabric is too busy to see it. I used a Kaffe Fassett rayon challis print. I'm in love with the print. I ordered the fabric a while back on a whim, not really sure what it was going to look like in person. The colors are vivid and warm. I tend to like a lot of the color combinations I see in his prints. They are striking and unusual. I was also interested in working with rayon challis. I love the drape but I'm not sure it was the best fabric for this dress pattern. I decided to skip the facings and line the whole dress. I fumbled my way through lining the sleeveless bodice. I had it all worked out in my head but got lost during the process of lining it. I ended up lining the front and back separately leaving the shoulder seams free. Then, I sewed the shell fabric shoulder seams and slip stitched the lining shoulder seams together. 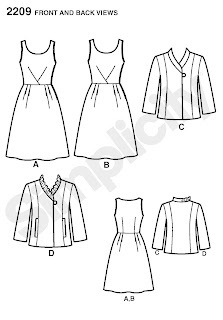 Since then, I found stitchywitch's tutorial for lining a sleeveless dress. I'll have to try it out next time. The zipper gave me a fit. I tried my first ever invisible zipper and it was... um, visible. Very visible. I tried again. Still visible. So I ripped it all out and put in a regular dress zip by hand, which is also visible but that doesn't bother me as much as one that's supposed to be invisible. I'll put one in right one day. I think putting a zipper in a side seam is much more cumbersome than one in the back. The only negative is the way the rayon pools a bit at the waist. At first I thought it was because the lining was a bit short or that I stitched it a bit too short. But after unpicking and sewing the lining at the waist seam three different times, the fabric still pools there. I think it may just be because of the fabric I chose. I don't think it would happen with a crisp cotton. It doesn't bother much, though. Artisphere was this past weekend in my little city. It takes place downtown in the West End. There is a beautiful park there, right on the Reedy River. There are opportunities for all sorts of artsy experiences all weekend- performing arts, concerts, culinary arts and of course, artist's row. More than a hundred artists come from all over the country to set up shop and peddle their wares. J and I headed down on Saturday to check it all out. The art was reeeaaallly good this year. Thought you might enjoy this one. Lisa Norris creates pattern collages inspired by vintage dresses and yes, that is actual pattern tissue in the collage. Found object sculpture by John Petrey. Falls Park has a crazy suspension pedestrian bridge over the river. You can feel it move if you stand still on it. I should have more pictures of the festival, but it was either put down my mojito and take photos or just enjoy the day and take it all in. I chose the latter. I did play with the camera at the end-of-the-night concert at the outdoor amphitheater. Our camera takes awesome night photos. No tripod with me so I laid it in my lap for these photos. I love this photo of J. And I saved the strangest photo for last. I was trying to get a picture of the moon but my camera needed something to focus on to take the photo. I stuck my hand in front of the lens just to get it to focus and then moved it as I took the picture. How crazy is that? That's our friend B in the middle. It looks like a giant celestial hand is either going to scoop him up or judo chop him in the head. Artisphere was mucho fun. Just another reason I love my town. On another note, I changed up the blog layout and colors so I can post bigger photos. If you are wondering why it looks different. Is is too gray and boring? I was going for clean and simple. One day I'll have a fancy header. I just found out that my spring kimono top is up for the first round of voting and I'm actually wearing it right now. Serendipity, eh? 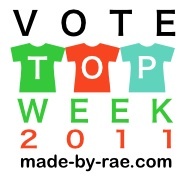 And, you know, if you want to vote...;) Click below. My top is in the day two group (Tuesday). Thus ends the shameless self promotion. These may not look like the most exciting little baby dresses in the world, but to me they are. That's because they are my own pattern. And they are both recycled from two summer tops I've owned for years and never worn. I guess I kept them around because I loved the fabric so much. Both tops were that breezy, tent-style that I just cannot rock. I need a little definition around the waist. When I say I "drafted" my own pattern, I mean that in the lightest sense possible. I used the height and waist measurement for a three month old from the Gymboree size chart and drew a basic bodice pattern piece free hand. I used the same piece for the back bodice, just adding in seam allowances for the zipper. The skirt portion of both dresses was determined by what was available at the bottom of the original top. No real technical skill here, just a bit of guesstimating. But still, I'm pleased with how they both turned out. Not bad for a first attempt. 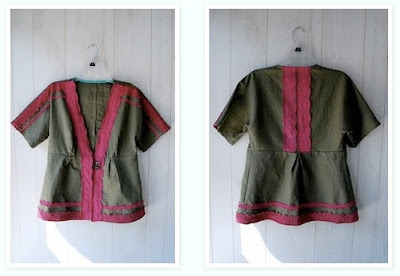 I kept the pockets and placket on the pink and green dress. I changed the bodice slightly on the all pink dress. It's slightly wider and the armholes are a tad bit smaller. The picture below is a good comparison of the two. I also changed the order that I constructed it and hemmed the sleeve openings before I stitched up the sides. That eliminated the need for an itty bitty bias binding around the arm hole, which was not an easy thing to sew. Both dresses are for baby M and I'm excited to see how they fit. She's not quite three months yet, but will be soon. She'll be one well dressed little baby, won't she? This was fun for my first time working completely from scratch. I thought I'd always rely on patterns, but I'm starting to see that there is an infinite number of possibilities when you can create your own patterns. It is something I'm interested in learning more about right now. Anyone know any good resources for drafting your own patterns? Any tips or tricks you'd like to share? Any pattern drafting tools you can't live without? I have two books on the way already. I'd love to hear from what you think. Happy sewing, everyone! 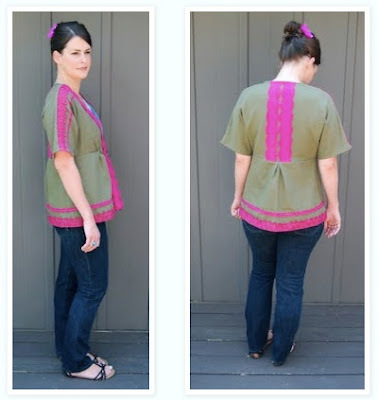 I was reading through the rules for the Spring Top Sewalong over at Made by Rae and one in particular stuck out- Selfish sewing only: Your top must be sewed FOR you and BY you. Right up my alley. I was checking out all the fun lace and trims at the fabric store the other day and was lamenting the fact that most everything is white or cream (or some hideous pastel) when I passed the Rit dye. Fuchsia went in to the basket, I'm not sure why exactly. I've been intrigued by Simplicity 2223 since it came out, especially the variation with lace, and had it mind when I left the store. I dyed the lace in our slop sink because I didn't think my husband would ever forgive me if I did it in the washing machine and subsequently dyed all his clothes pink, too. The slop sink is in the laundry room directly next to the washer so it was all very convenient. I doubled the amount of dye and added a cup of salt. I was expecting to see some variation between the cotton and polyester lace, but it either took the dye or it didn't. I only had one completely polyester strand and it didn't change at all. I didn't end up using it on the top. After I rinsed for what seemed like forever, I washed it twice in the washing machine (I threw it all in an old pillow case and tied it closed) and then laid it out in the sun to dry. At that point, I went back to the fabric store to look for the right color linen. I had a plan in my mind with some aqua or robin's egg blue linen, but of course I didn't find anything like that. Then I spied this dark khaki linen. I like the contrast of the bright, vivid fuchsia and the drab khaki. I think another bright color would have been too much. The color in the double photo above is more subdued than it is in real life. The pattern was straight forward. I didn't make any changes except I used french seams everywhere, even on the waist seam. I'm not sure if that is appropriate there or not, but everything is nice and finished on the inside. Linen seems to fray a lot. 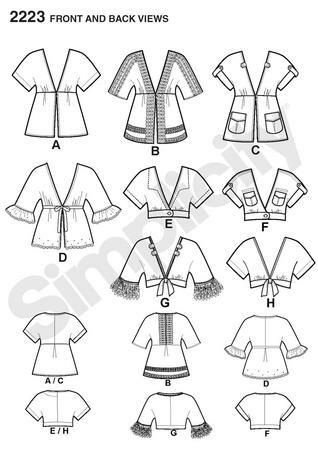 The pattern if fairly simple but all the trim complicated the process. I must have switched thread and bobbins five or six times while sewing. I used a turquoise bias binding for the neck edge. I had the two buttons on hand already. I made the white top to wear underneath because I was concerned with making everything myself for the sewalong. I used my tried-n-true Burda Magazine 102, 2-2011 long sleeve tee pattern. I left off the sleeves and scooped out the neckline, thinning out the straps a bit. I used lingerie elastic around the neckline. That was a quick and easy way to finish a neckline on a knit top. I'll be keeping some of that elastic on hand from now on. Hooray for practical sewing! I know I'll get tons of use out of this. I'm really pleased with the finished product. It's definitely reminiscent of a kimono, I think. I know I'll wear this quite a bit as it goes with several things in my closet. I'm interested in trying the cropped version, too. I think it would look good with high-waist skirts and pants. And do you see the variation with the running stitch collar? That's a neat detail. Thanks, Rae, for the fun sewalong! I highly enjoyed my selfish sewing day. Maybe I should make that a monthly deal? 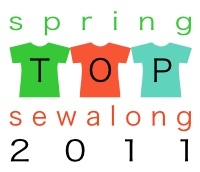 Check the the Spring Top Sewalong flickr pool to see all the other amazing entries. I wasn't sure about posting this at first-- it's nothing but complete and utter craftiness. But after having so much fun making these tissue paper cherry blossoms, I decided to share. Plus I had super fun taking photos (can you tell my by choice of adjectives that I'm around kids all day?). I've been trying to up my photo taking game and played around with some of my camera's settings. And what's more spring-y than a cherry blossom? We have a weeping cherry in our front yard and it was gorgeous a few weeks ago, though the blossoms didn't last very long this year. I did a quick art lesson with my fourth graders the other day where we made these sumi-e style cherry blossom bookmarks (below). I did not come up with this art project. I'm on a group wisdom email list with other art teachers and all sorts of projects and inspiration get passed around from time to time. This project came in my inbox after the recent earthquake. I decided to use it because the end result is so beautiful and I think it's nice to have students be a little more socially aware of what's going on in the world. We talked about the recent earthquake and tsunami, about how families in Japan are just like our families and still picking up the pieces. Just trying to promote a little empathy. And get this-- during the class we had an earthquake drill. What are the chances? It was great for more discussion. I'll be brief about the art lesson. We dropped a few big droplets of very liquid black watercolor on a nice piece of gray paper. Then, we used a straw to blow the paint in to an organic line. Quite amusing from the teacher's standpoint. Then we used a little bit of red, white and yellow watercolor for the blossoms. I prefer tube watercolors over pan watercolors. We actually just sort of stamped with the side of the paint brush. They all end up lovely, no matter what. We made a few- some were taken home as Mother's Day treasures and some were given to PTA volunteers for their yearly volunteer appreciation dinner. Now here's the part I did come up with. I decided that a cherry blossom centerpiece would look nice on each table at the dinner but, alas, no more cherry blossoms in my yard. I ended up making some from a few things I had around the art room; tissue paper, copy paper and pipe cleaners. Here's what I did, though you can probably make it out from the photos. I cut circles from hot pink, light pink and yellow tissue paper. The yellow circles are fringed around the edges to mimic the center of a cherry blossom. I also cut some small circles from red copy paper to use a stopper on the pipe cleaners. Twist pipe cleaners together to make the branch. I layered a couple of hot pink circles, two or three light pink circles and one yellow circle to make each blossom. I like it better when they are not perfect circles. Push a stopper circle on the end of a pipe cleaner- just keeps the blossom in place. Push the tissue paper circles on and fold over the end of the pipe cleaner. And then squish the whole thing. Put some place pretty and enjoy.